Up to this point I have shared a couple of personal stories on the blog about my experiences with rain ponchos and the weather. This coming week I am going to change things up a little bit. Instead of sharing a past experience, I am going to purposefully create an experience to blog about. At my college, I am in a group known as the Multicultural Club. We get together and plan events for the school, go on trips together, and in general enjoy each others company. This weekend the entire group is going to Niagara Falls to enjoy the view and enjoy a lovely 7 hour ride in a cramped van together. My brother got wind of this trip and immediately send me a text that was essentially a dare to go the entire weekend at Niagara Falls with no rain poncho, no umbrella, no anything. Basically he wants me to make a fool out of myself in front of my peers. 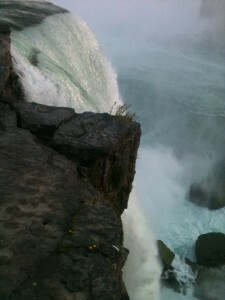 To avoid being called a wimp or pansy, I have decided to accept the challenge and document my weekend at Niagara. I’m not exactly sure how wet I will be getting, but considering the fact that Niagara Falls dumps roughly 6 million cubic feet of water every minute (A million bathtubs basically), I am guessing that I am going to get pretty darned wet. So this post is basically me signing away my chances at a dry and comfortable weekend. Shout-out and thanks to the Multicultural Club for making the trip possible at all, you guys are awesome. Another shout-out to my brother for issuing the challenge, you stink Jared. Check back in on Friday to see some details on the trip, and on Monday to see pictures of me drenched. I am not entirely sure how much of it can be documented (water + camera = bad), but I will try my best.